A total of 496 people hand-washed clothes simultaneously, at an event organized by Dhobi Kalyan and Audyogik Vikas Co-op Society, India, on March 8, 2011, at Dhobi Ghat, Mumbai, India. 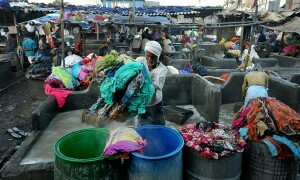 Dhobi Ghat is an open air laundry and a famous tourist destination. Comments for MOST PEOPLE HAND-WASHING CLOTHES SIMULTANEOUSLY (SINGLE LOCATION) are now closed.